The world has lost almost half of its original forest cover, largely tied to accelerated population growth and agricultural expansion. Although forests are quickly disappearing, there is a tremendous amount of unused land that if restored, could support woodlands. Through the Atlas of Forest Landscape Restoration Opportunities, it has been found that more than 2 billion hectares (about 8 million square miles) of land worldwide have the potential to be restored, many of which are located in unexpected regions. Blue Raster and the World Resource Institute created an online mapping application helping users find suitable land for sustainable agriculture. 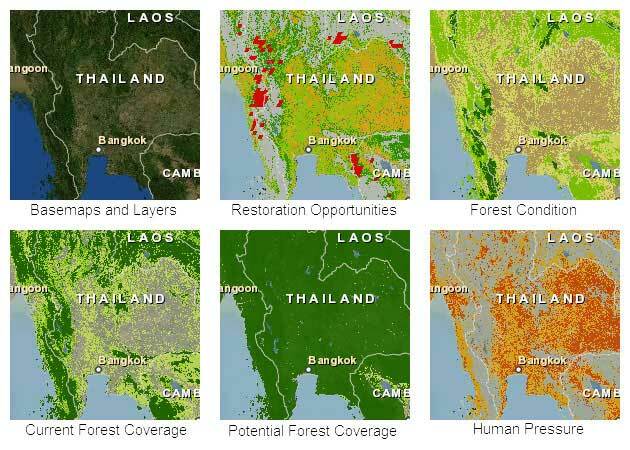 Sustainability and Restoration are key components of saving our environment, so these map projects are extremely useful tools. 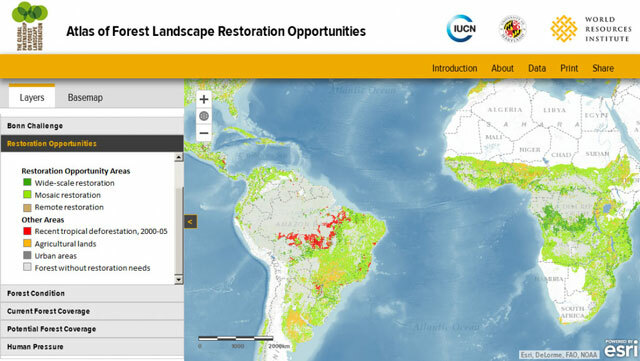 The Atlas also shows restoration potential for individual countries and regions. For example, Cambodia’s tropical forests have been damaged by illegal logging and plantations giving it the highest percentage of land in the world (30 percent) with opportunity for wide-scale restoration. Many opportunities for restoration lie in the northern portion of the country due to low population density. The areas of land highlighted in red represent deforestation that has occurred within the last decade.